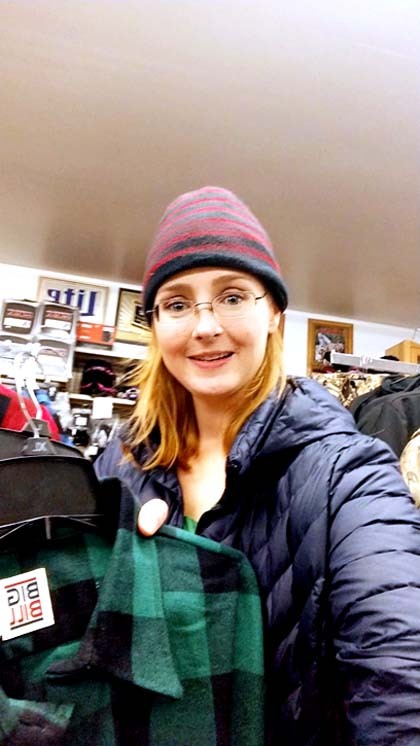 Photo provided by Leah Polzien Lynette Webber shops for flannel at Harter’s Party Store and Outdoor Sports Center during Ladies Night’s Open Season on Sales on the evening of the opening day of deer hunting season. CALUMET — It was Open Season on Sales during the Main Street Calumet Ladies Night, which took place on the opening day of deer season, Nov. 15. The night was a success for local business owners who saw increased sales and foot traffic from the event, said Leah Polzien, MSC executive director. Amy Knight of Calumet Floral and Gifts reported 350 people entered her store’s drawing and she knows many people stopped in to shop but did not enter the drawing. Valerie Baciak, owner of Keweenaw Coffee Works, said she estimated anywhere from 700-1000 people visited her store on the night of the event. Although businesses in the more sparsely populated blocks of Calumet did not see the crowds, they still saw a significant uptick in sales. This is the second year for the event put together by Main Street Calumet and Polzien seemed to feel positive about it.